Online college has grown in popularity for a few obvious reasons. It’s more flexible, more accessible and more convenient. For adult learners, non-traditional students, underserved populations and countless others, these benefits have created a whole new set of educational and professional opportunities that would not have been possible through traditional models of education. Perhaps less obvious among the benefits of online college, however, is the positive experience that so many report about their interactions with professors and other instructors. In fact, the satisfaction that so many online students report with their professors seems to contradict one of the greatest presumed drawbacks of online education. Critics of online education have warned that the remote nature of online instruction could have the impact of lessening student motivation, commitment, and engagement. Countless testimonial responses paint a different picture, suggesting that in fact, the online education experience is uniquely situated to facilitate strong and meaningful connections between students and educators. There is a growing body of evidence that students in online college enjoy a high level of satisfaction, even higher, in fact, than the satisfaction reported by traditional college students. For traditional educators, the findings might be surprising. They are, perhaps, less surprising to online college students, who have consistently given high marks to the online educational experience. This is something we certainly found in the 1000+ testimonials we received in response to our Online College Scholarship contest. Applicants spoke effusively about the positive personal growth and opportunity made possible by online education. One of the common threads tying together testimonial after testimonial was the highly complimentary language reserved for online college professors and instructors. Students expressed a sense of gratitude for the attentiveness, qualifications, and genuine dedication of online professors. This was an eye-opening finding, and a strong counterpoint to critics who think of online education as impersonal or disengaged. In fact, say students enrolled in reputable online courses, the relationships you’ll form with your instructors are among the best reasons to pursue an online education. I think I have had a better relationship with my online professors than I did when attending on-campus classes. The professors try harder to facilitate communications not only between themselves and one student, but with the whole class in general. This also applies to the students as we seem to put a little more effort into our communication skills. Communication skills are obviously essential to education no matter the context, but they take on added importance in online education. Professors must learn how to effectively communicate information, instructions, ideas, complex concepts, and real-time feedback without the benefit of a common physical space. For online educators, this demands effective use of various communication media, including email, social media, video-conferencing, and much more. Many online college students report that their online instructors are uniquely skilled at using and balancing these media. In fact, because there is such a strong emphasis on effective communication, some online educators have learned how to instruct, articulate, and interact with students in ways their on-campus counterparts may not have mastered. The best online college professors are those who understand the various media at their disposal, and have the ability to adapt communication strategies accordingly. Attending college online means I can complete my work wherever there is an internet connection. Although it’s still challenging, this means I can technically still go to school during a cross-country military move. My online professors still care about personal relationships, social interaction, and communication...but most of it happens through writing. Because my degree is focused on written communication (especially in the digital age), this has been a true benefit. In some cases, students don’t have a choice. Online college is the only option available for pursuing a degree. The military service-member quoted above demonstrates just how important it is for students in this situation to have meaningful relationships with instructors. In fact, in some instances, the ability to foster a meaningful relationship may be greater through the online medium. The vast majority of traditional students will interact with their instructors during shared classroom time, where it can be difficult to build personal relationships with your professors. By contrast, asynchronous online communication allows students and professors to exchange messages and ideas free from those time constraints. As a result, many online college students report uniquely satisfying, one-on-one relationships with graders, instructors, and professors. I have found that being able to dive into the material at my own pace has allowed for me to gain a deeper understanding of material than if I was beholden to the whims of a lecturer in a 300-person lecture hall. Additionally, I find that professors are more available and responsive to me, and I feel that I get more individual attention than I ever would in a traditional program. Online college students report that they not only enjoy the flexibility of being able to work at their own pace, but that online professors are often better at adapting to the pacing needs of each individual student. Online education allows the instructor to be in several places at once, to provide direct support to individual students, and in accordance with their own respective needs, without impacting the progress of an entire cohort. By freeing educators from traditional classroom models of pedagogy, online education makes it possible to accommodate both students who need a little extra help and students who require a more accelerated learning experience, all without disrupting the flow of lectures or shared “classroom” time. There are numerous reasons and a multitude of benefits that come along with an online degree compared to a traditional degree but the ones that stand out most would be the professors and the time and scheduling. At first I was wary of online professors and how they would stack up compared to in-person professors. To my surprise, at the University of Florida, some of the same professors that were in-person also taught online. This means that you know you are getting top quality teaching at a pace you enjoy as well as the amount of hours you want to put into a class rather than spending upwards of 3-4 hours in a small classroom. You are able to time out and schedule around your life as you please which has been the biggest blessing of my life. Perhaps one of the reasons online college students have such nice things to say about their professors is because most online professors are already highly respected and qualified educators. Indeed, the best online colleges can usually boast a significant overlap between online and on-campus professors. In the best and most reputable online schools, the online courses, curricula and professors are nearly identical to their on-campus counterparts. This is a feature that you might want to seek out in your search for the best online school. 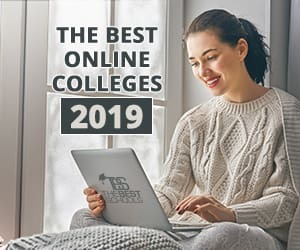 If you’re interested in experiencing the high level of instruction and engagement described by countless online college students, start your search by checking out the Best Online Colleges for 2019.